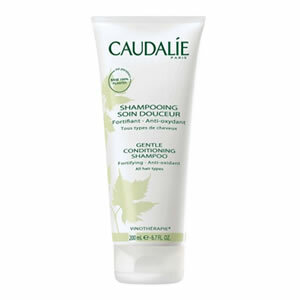 Caudalie Gentle Conditioning Shampoo creates ultra-shiny, super soft hair with the delicate scent of Fleur de Vigne. Caudalie Gentle Conditioning Shampoo is a concentrated shampoo composed of natural conditioning and active ingredients, which cleanse, fortify and protect hair, even colour-treated. This extremely gentle plant-based formula is perfect for frequent use on even the most sensitive hair. Grape vinegar and grape-seed extract give your hair lightness, shine and brilliance.